A Conservative MP has accused the DUP of holding his party to ransom over Brexit. 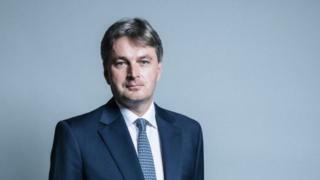 Shrewsbury MP Daniel Kawczynski said he would prefer the prime minister to call a fresh Westminster election rather than renew his party's confidence and supply arrangement with the DUP. Referring to the DUP, Mr Kawczynski said he does not "want the tail to wag the dog any longer". He was speaking on BBC Radio Ulster's Inside Politics programme. Mr Kawczynski, who earlier this week quit the Eurosceptic European Research Group, also said the current "national humiliation" cannot be allowed to continue. He said that once the withdrawal agreement is ratified, the whole of the UK political establishment will work to avoid the Northern Ireland backstop being implemented. Questioned about comments he made in November, arguing for changes in the Northern Ireland backstop, Mr Kawczynski acknowledged that he had changed his mind. He said "sometimes changing your mind is a sign of strength not weakness". However, he believes that if MPs do not vote for Mrs May's Withdrawal Agreement soon, they will be "putting at risk the whole Brexit process". "How much longer can we continue to have this gridlock and paralysis?" the MP asked "because 10 members of parliament from Northern Ireland refuse to compromise in any way shape and form?". He said he is starting to listen more and more to the independent unionist North Down MP Lady Hermon, who backs the prime minister's deal, because of what he describes as the "huge indifference and intransigence the DUP are showing". Responding to the criticism, the outgoing DUP MEP Diane Dodds said the "withdrawal agreement has not changed one iota" from the one he had previously voted against. Mrs Dodds reiterated her view that the withdrawal agreement would separate Northern Ireland from the rest of the UK in a way which would not be good either constitutionally or economically. She maintained that her party had been pragmatic by making it clear that if the EU and the UK "deal with the backstop then we are in business". Mrs Dodds said she had no record of a meeting which the Times newspaper claimed had taken place in Westminster this week between the DUP leadership and Boris Johnson. Mrs Dodds said the DUP "are not in the business of taking on who is the leadership of the Conservative party". "Whoever the Conservative party decides should be their leader, whether that is Mrs May or Boris Johnson, or whoever that may be, that is the person we will deal with," she said. "Our confidence and supply arrangement is with the Conservative party it is not just with the Conservative party leader. "So we have no vested interest and will be staying well away from that particular contest."